The Clinic Program, a pioneering program of collaboration between industry and Harvey Mudd College, has been a hallmark of this institution for more than 50 years. Juniors and seniors are engaged in the solution of real-world, technical problems for clients, most of them in industry. Clinic teams also apply their academic experience to projects with nonprofit sponsors. New for the 2018 academic year are three projects focused on issues of social justice, funded in part by an educational leadership grant to President Maria Klawe from the Carnegie Corporation. HMC’s social justice Clinic project with Claremont Locally Grown Power (CLGP) has the potential to impact members of the local community. 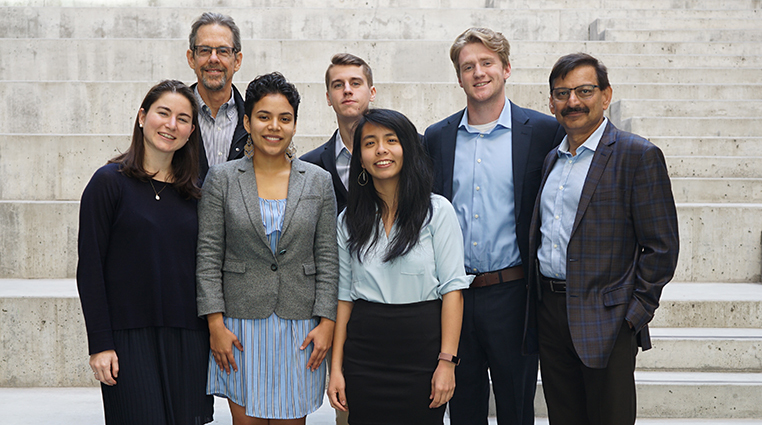 For their project “Local Factory Startup,” a team of five students is helping CLGP—a start-up that is creating replicable, non-profit solar panel factories—open a pilot factory in Pomona, California. CLGP aims to promote economic and environmental change by installing 6,000 solar systems on low- to mid-level-income households. Clinic team members and seniors Nate Smith, Giulia Castleberg, Christopher McElroy, Priscilla Chu and Jacquelyn Aguilera (Pitzer) are designing a world-class solar panel factory by producing an optimal plant layout, outlining detailed workstations and determining specific machines, tools and equipment. “I am so glad to see our students making an impact on society while learning and applying their technical and professional skills. This aligns beautifully with the College’s mission statement,” says Kash Gokli, project advisor, professor of manufacturing practice and Engineering Clinic director. Harvey Mudd College and its Hixon Center for Sustainable Environmental Design have partnered with Community Home Energy Retrofit Project (CHERP) and idealPV to teach students how to construct, test and ultimately distribute solar panels. Since October 2016, students have engaged with the project through paid internships via the Energize Colleges program and through additional opportunities, including the CLGP Clinic project. Read more about the “Local Factory Startup” Clinic Project and the Harvey Mudd student team in the March 6 The Student Life article, “Harvey Mudd College students to design world’s first nonprofit solar panel factory” by Ben Reicher.